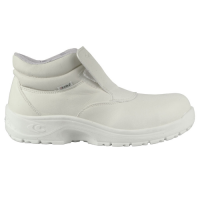 The Cofra Remus are metal-free white catering safety shoes. The shoe is made from water repellent ECOLORICA® and breathable SANY-DRY® fabric lining. The EVANIT footbed made of EVA is highly breathable and maximises comfort.